In the 1980s, Americans started getting sick at work. Their heads ached. Their eyes, noses, and throats itched. Many complained of fatigue, and dizziness and nausea. Weirder still, all of these symptoms disappeared the moment they left work. At first chalked up to laziness, the phenomenon grew and spread, affecting everyone from the mail room guy to the CEO. It was as if America was allergic to work. It turns out that the introduction of copiers, faxes, printers, and other toxin emitting machinery, combined with you know, smoking inside, made employees sick en masse. Modern medicine dubbed the affliction, Sick Building Syndrome (SBS). Around the same time SBS was becoming a buzzword, NASA was compiling its Clean Air Study that investigated the efficiency of various plants in purifying the air with the goal of using them on space stations. Corporate America took note. If these plants could clean the air on space stations, why not in a smokey offices full of ozone and radiation emitting equipment? Why not indeed. And so the boom of the office plant was born. As a lover of plants and clean air, I embrace this trend wholeheartedly. I am also fortunate to have a coworker who makes it a point to bring me plants from her garden and sometimes just from her walks around the neighborhood. She often surprises me with fresh cuttings that she pulls from her purse with their stems wrapped in wet paper towels wrapped in reused plastic bags. I am a bit dramatic when she reveals them, thanking her profusely and at times, I allow myself a little jump, unprofessional as that may be. But what better present is there than a plant? Then begins the hunt for a vase or vessel to put them in and space on my desk for them to fit. 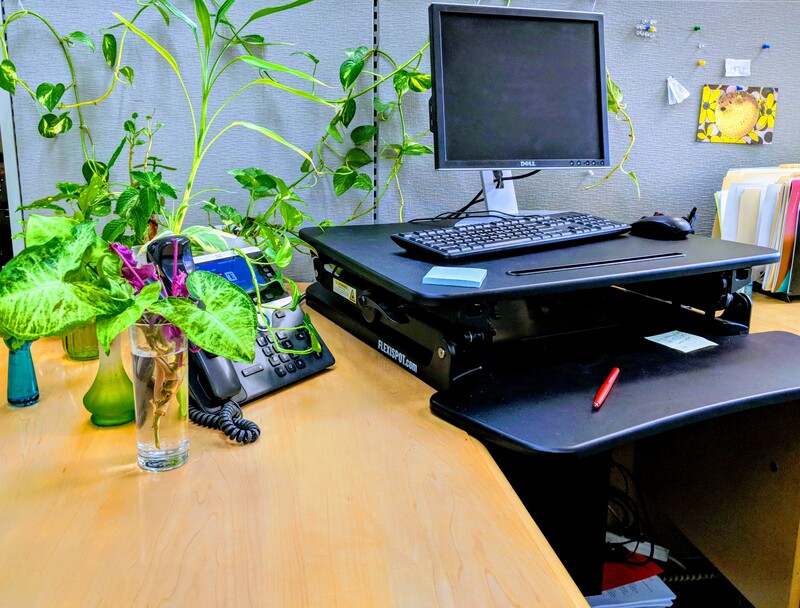 After a year and change on the job, my desk has become an odd little verdant patch that grows greener by the day. It’s a great place to work.